I think it turned the whole sport around. It got everybody’s attention. People who were watching TV live were jumping up and down in their living rooms. If he’d just crowded me down to the side of the asphalt, I’d have been OK. But when he ran me completely off the racetrack, I lost it. 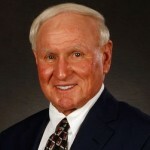 Cale Yarborough is a farmer, businessman and former NASCAR Winston Cup Series driver and owner. He is one of only two drivers in NASCAR history to win three consecutive championships. He was the second NASCAR driver to appear on the cover of Sports Illustrated His 83 wins places him at number six on the all-time NASCAR winner's list.